I am a salad lover and I know you too. Vegetables and fruits are the king and queen of the salad world. We are trying a salad with the princess of fruits ‘ms.pomegranate’. It is not funny that pomegranate has some unbelievable benefits over our health. As we all know apart from healthy benefits pomegranates are tasty also. They are good source of vitamins and folic acid and antioxidants. Clearly it is a cheap but healthy powerhouse. 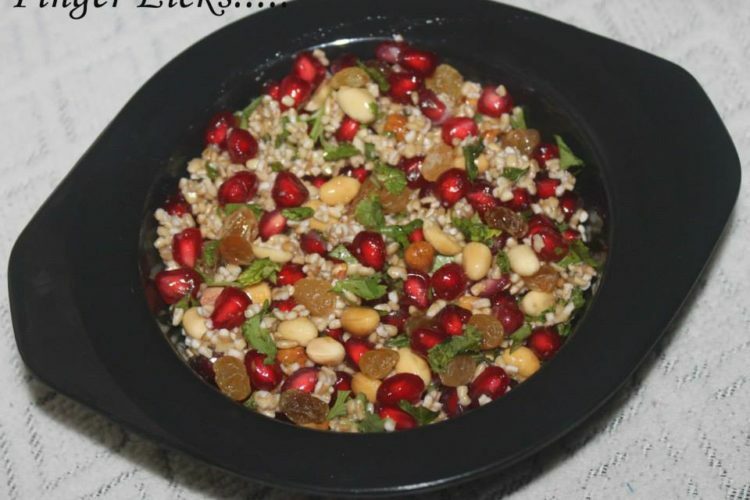 Pomegranate salad is a flavour healthy mix of pomegranate with broken wheat and many other ingredients. Transfer ½ cup broken wheat in a bowl and add 350 ml boiling water over it. Let it soak for 30-35 minutes.Drain and squeeze out excess water from broken wheat. Transfer to a mixing bowl and add rest of the ingredients including pomegranate. Mix everything well and serve immediately.